The 4 storeys apartment with a basement received a new facelift both exterior and interior. 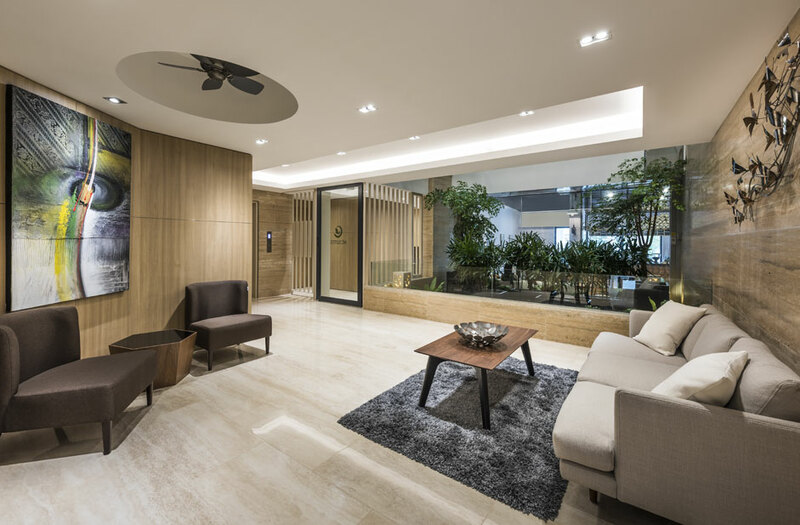 We worked with Topic Design Studio as the Interior Design Consultant responsible for designing all the units’ interior, main lobby and upper floors common corridors. Instead of adding new texture or cladding onto the existing façade, we proposed instead to work with the geometry deriving from the existing windows along the facades as well as the structures. By subtly altering existing windows height and topping up with additional layers of brick to flush and even out the recessed areas, we created an interesting facade that doesn’t shout out but intriguing to look at, coupled with lighting effects on the side of all windows. There is also an existing air well which we retained and maximize the openness of the corridor by changing the existing parapet walls to fixed glass railings on the upper floors.